2005 goals in 1288 games, 155 goals in a season and 16 goals in a single game. Pele? Messi? Rooney? No, this is the story of a more prolific goal scorer known as ‘Rappo’. 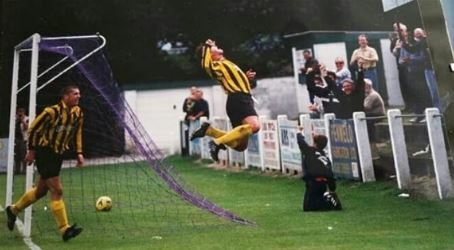 Born in Truro he has been scoring goals in Cornwall for over twenty years and holds the record for the most non-league goals in football. Mark ‘Rappo’ Rapsey is a legend amongst men in Cornwall. Starting his senior career at the little age of 14 Rappo was finding the net across the county from the early 80s and found his 2000th goal in football last February. Playing for Wadebridge Town in the Cornwall Veterans League Rappo stepped up and converted a penalty to etch his place into Cornish folklore forever. Once a youngster in 1981, the 14-year-old scored 43 goals in his first season of adult football. He thanked his ‘blistering pace’ for most of his goals across his career but surely, he had more in his locker than a fast pair of legs. Unfortunately, an injury ruined his chance at Exeter City and Alan Ball never did get to name the Cornishman in his first-team line-up. 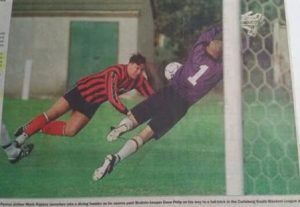 He did get another chance to make it at a professional level when Peter Shilton, Plymouth manager at the time, came sniffing but the move never materialized. It’s a shame that Rapsey never made it at the professional level as many (including himself), thought that he could have carried on playing consistently for a professional club and made a big success of it. He added: “We played really well on the day and I got the goal in the 79th minute that gave us a one nil victory. I just remember the crowd being full of all my friends and family. Whilst Rooney enjoyed the lights of Old Trafford every Saturday, Rappo had some of his best moments whilst playing at Falmouth Town’s Bickland Park, he spoke very highly of the ground which home to hundreds of his goals referring to it as a ‘proper football ground’. Looking back at Rooney during the 2009/10 season he found the net an impressive 34 times for Manchester United, this was the Englishman’s most prolific season. During the 1991/92 season, Rappo found the net 155 times, ONE HUNDRED AND FIFTY-FIVE. During that 91/92 season, Rappo played against Culdrose at Bickland Park and scored an incredible 13 times. Rooney might be the top scorer of all time for England with 53 goals but had Rappo played with the three lions on the chest who knows how many he might have got. Maybe he’d have made the difference in that 1990 World Cup? 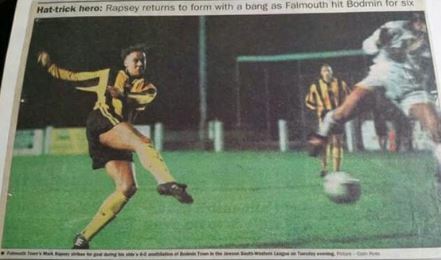 Okay, I’m not really saying Rappo was as good as Rooney but how good was the Cornishman? It’s hard to say really, he has a better goal record than Rooney, but could Mark ‘Rappo’ Rapsey have made the cut at the highest level? We won’t ever know. I think the real question is could Rooney turn it on every Saturday at Bickland Park?